This is very close in taste to pork sausage, but is much lower in fat and calories. I like to make a batch up of this once a week. It keeps well for several days in the fridge and makes for a quick "grab and go" breakfast. It also freezes well! This recipe is well liked by adults and kids alike! 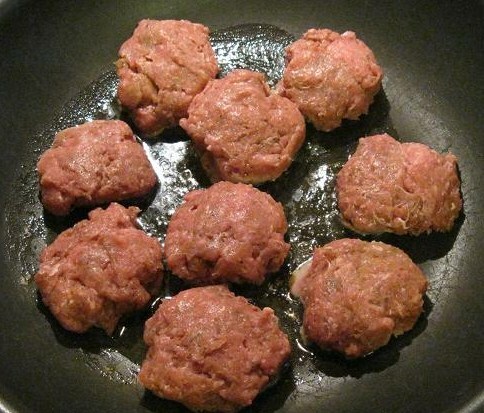 Mix ingredients and then form sausage shaped patties. Pan fry in non-stick cooking spray or a bit of olive oil until cooked though. *I like to put a lid on over the sausage the first 5 minutes or so before flipping the sausage - then I leave the lid off and turn up the heat to high to quickly brown both sides. Sometimes if I get a batch of watery ground turkey (it just happens sometimes) I'll drain the water after it is cooked through so it will brown on high.